Well, I’ve got tasting notes on lots of beers I’ve sampled in the last several months. Here is one review for your beer drinking pleasure. Please read responsibly. Underbite Double IPA: Big Dogs Brewing Company, Las Vegas NV. 8.7% ABV. In my last newsletter I mentioned this beer, and promised a review, plus the story behind the brew and how it ended up at Mac’s Beer Appreciation party. Now, I know that was a tease, but here’s the story, and I didn’t make you wait long for it. On Saturday August 11, 2018, I attended the Festival of Flavors at the Brianhead Resort in Brianhead Utah with my brother, Don Evans. This was a beer, spirits and wine tasting event (held annually at the resort). There were several Utah breweries in attendance, including Wasatch, Talisman, Squatters, and others. While there, Don introduced me to his friends, Charlie and Amanda Koeller. It turns out Amanda is one of the three brewers at Big Dogs Brewing Company in Las Vegas, Nevada. 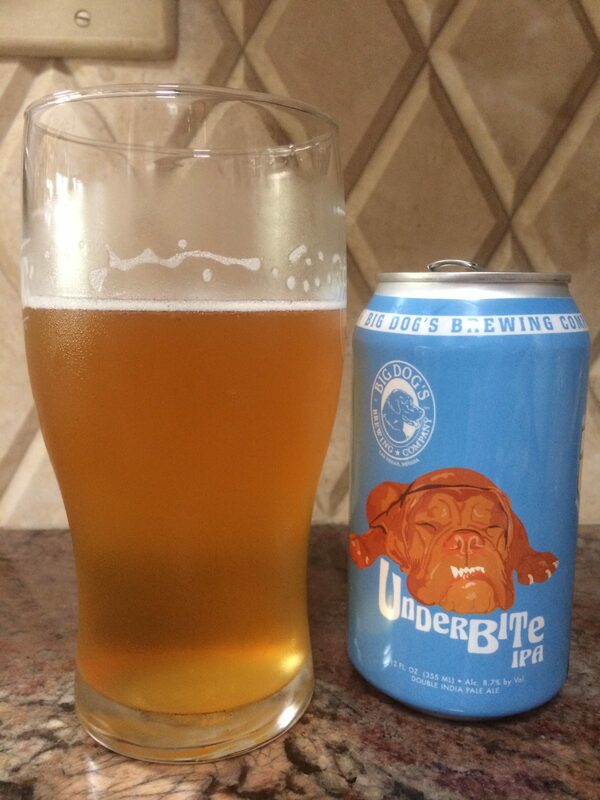 While talking with Charlie he showed me a photo of his dog, Sorrel, a Bordeaux Mastiff (think Tom Hanks’ dog, Beasley, in the movie Turner and Hooch), and explained that the photo inspired the drawing on the Underbite Double IPA can (which he also showed me a picture of). With my curiosity piqued, I spoke to Amanda, and immediately formed a bond of friendship when I discovered that she was a brewer at Big Dog’s Brewing Company. Amanda explained how she came up with the recipe for Underbite IPA the night before it was brewed, putting the finishing touches on the recipe well after midnight. It was supposed to be a one-off brew, but demand for the beer was very high, and Big Dogs decided to add it to their core line-up. I told Amanda that I found IPAs difficult to brew exactly how I envisioned them, and was impressed that her first iteration of this brew was spot on and so wildly successful. Unfortunately, Amanda said Big Dogs beer is not distributed outside of Nevada, so I was not going to be able to get it in California. Lucky for me however, the story doesn’t end there. That night, long after the event was over, Amanda and Charlie came over to Don’s cabin in Brianhead and brought Sorrel, along with a couple of Underbite Double IPAs to share. Although I had already had enough beer for the day, how could I turn down the opportunity to drink this IPA with the designer/brewer and the dog whose face graces the can? Of course I sacrificed and had a can of Underbite with them (see photo). I REALLY enjoyed the beer, and Amanda agreed to give Don a case of it to bring to Mac’s Beer Appreciation party. 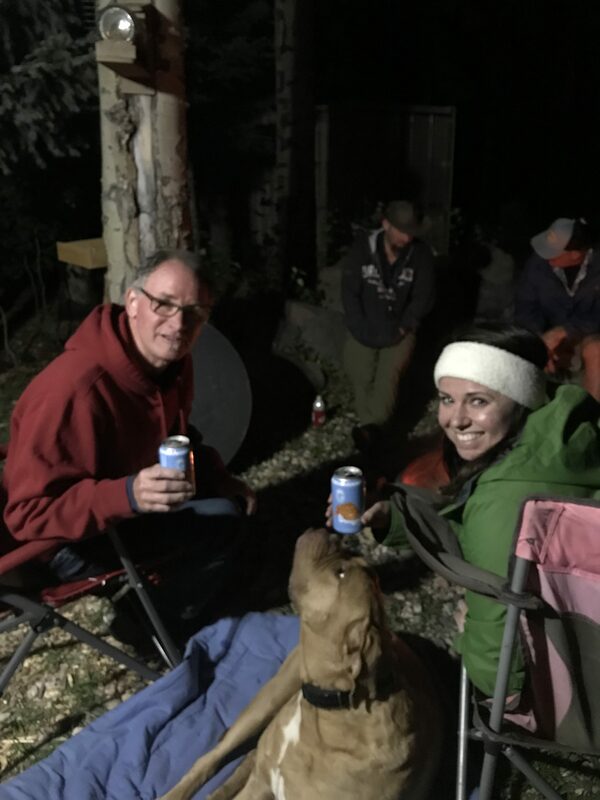 Amanda Koeller (the brewer), with Sorrel (the inspiration) and Mac, enjoying Underbite Double IPA. 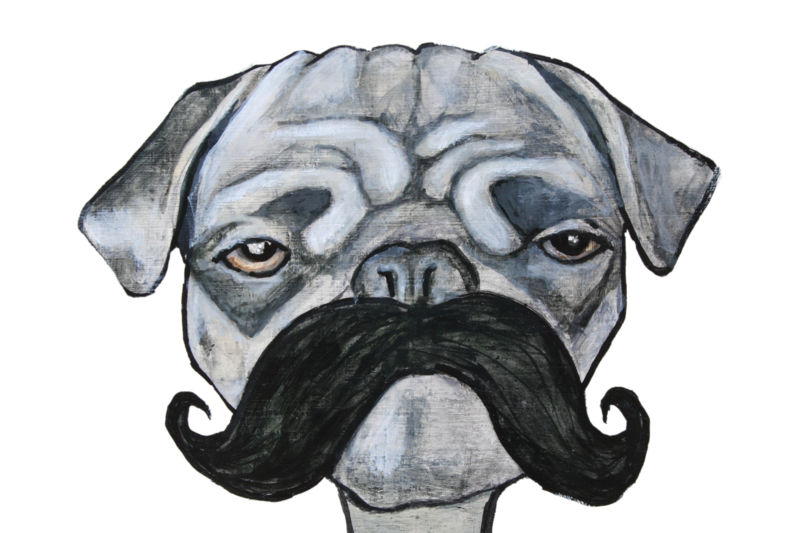 Underbite pours a slightly hazy straw yellow color with a ½” head that fades after a couple of minutes to a thin ring around the perimeter. The aroma is tropical fruit, apricot, citrus and lemon. The flavor follows the nose – citrus, grapefruit, lemon, and pine, with a dry finish and a bitter grapefruit/lemon aftertaste. The bitterness lingers on the back of the palate. There is some malty sweetness to this beer, as is typical with a Double IPA, but overall the sensation is bitter and dry. Underbite has a medium carbonation level with medium body and mouth feel. The alcohol content is fairly high at 8.7%, but is well hidden, and not noticeable in the flavor. This beer is very refreshing and easy to drink. It’s a typical bittersweet DIPA, but it leans more toward bitter, less toward the malty end of the style range. One could put a lot of it down on a hot day, but be careful, that high alcohol content could put the hurt on you. Very well done, Amanda! And Sorrel, thanks for inspiring her. I highly recommend this beer. 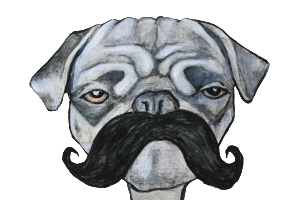 Underbite Double IPA is available in 12 oz. cans. Unfortunately for most of us, it’s only available in Nevada. But, next time you go to Las Vegas, pick up a sixer or two and bring it back home with you (and in that case, what happens in Vegas WON’T stay in Vegas). I normally review more than one beer when I publish beer reviews, but this one got quite lengthy because of the associated story. Stay tuned, however, I’ll post more beer reviews soon. This entry was posted in Beer Reviews and tagged Big Dogs Brewing, Underbite Double IPA by macsbrew. Bookmark the permalink. Dad and I enjoyed your review even more than usual. Maybe it was because we attended your Beer Appreciation party, heard Don tell the story, also had a taste of the beer! Keep the reviews coming, we find them not only informative but entertaining. Thanks, that’s what they’re supposed to be – informative and entertaining. I’ll keep them coming as much as I can. I bet you almost feel like you know Amanda Koeller and Sorrel now.